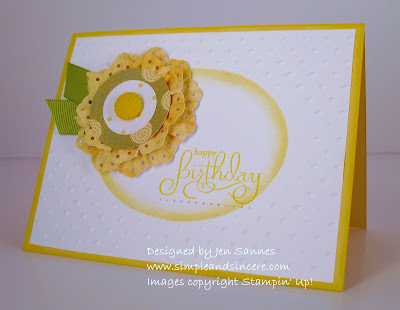 Today's birthday card is a combination of a couple of fun techniques and some bright, cheery colors. What a pretty and elegant way to brighten some one's special day! I tried out a couple of new techniques on this card (new to me, anyway!). First, I tried Blank Embossing on my Whisper White cardstock with my Perfect Polka Dots embossing folder and my Big Shot - that's how I got the open oval space in the middle where I sponged ink and stamped my sentiment. If you're not familiar with this technique, click here for a wonderful tutorial by Patty Bennett. The second new technique I tried is making a flower with the Eyelet Border punch and my crimper. I saw this demonstrated at Leadership and I was blown away by the finished embellishment. I cut a 1" x 12" strip of designer paper (from the Sweet Pea Designer Series Paper Pack) - cardstock can also be used - trimmed the entire length of the dsp with my Eyelet Border punch and ran it through my crimper several times. Next, I punched a 1 3/8" circle out of scrap cardstock and applied several pieces of Sticky Strip over the surface of the circle, trying to cover as much area as possible. After removing the backing on the Sticky Strip, I carefully wound my strip of dsp around the circle, working from the outside edge to the inner portion of the circle. I embellished my flower with a couplt more circles of dsp (also from the Sweet Pea Designer Series Paper Pack) and a Summer Sun corduroy brad. I love the end result! CAS 49 - Cut it out!